ABA-CRIMP-1EA-1C is a single stage electronic crimper which is mounted on a continuously running conveyor. The ABA-CRIMP-1PA-1C is a single (1) stage Pneumatic Automatic 1 head crimper unit which is mounted to a Continuously running conveyor. 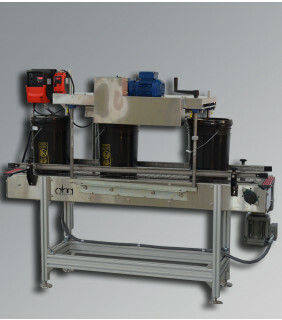 The ABA-CRIMP-1PA-1I is a single (1) stage Pneumatic Automatic 1 head crimper unit which is mounted to an Indexing conveyor. The ABA-CRIMP-1PS-1NA is a single (1) stage Pneumatic Semi-Automatic 1 head stand-alone crimper unit which crimps 3-5 gallon metal lids. 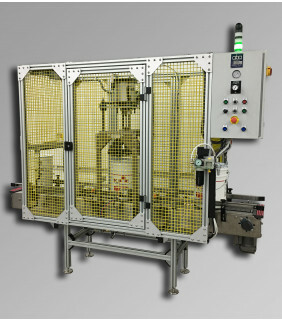 The ABA-PRESS-5GALL-P is a powered lid press unit. 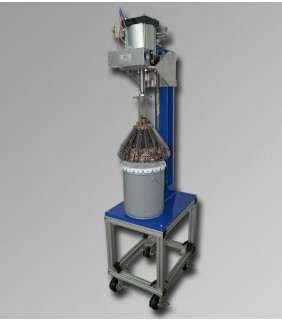 ABA offers a variety of lid closing machines designed to work with a wide range of container sizes and styles. For 5-gallon metal pails, we offer lid crimpers in both automatic and semi-automatic models. Each crimping tool is specifically designed to work with the exact lid utilized by our customer. To close plastic containers and smaller metal containers (ie gallons and smaller) we offer roller lid press units, powered roller lid press units, and even semi-automatic stand-alone plate lid presses. Regardless of model, all of our lid closing equipment is manufactured with the highest quality and safety standards in mind. As with our liquid filling machines, our lid closing equipment can be custom designed to best suit each of our customers’ needs. 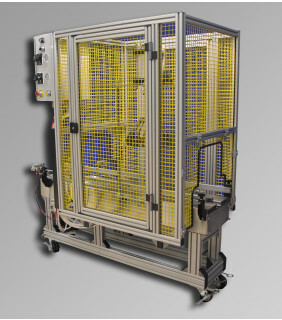 We can offer lid closing equipment which is pneumatically or electrically controlled and can provide machines which are designed to be used in C1D1 or C1D2 hazardous environments. We have also designed and built a roller lid press and conveyor comprised completely of stainless steel parts and a stainless steel wash-down motor for use in a salt processing plant. 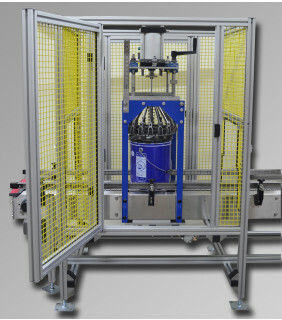 Please contact us today for more information on our available lid closing equipment and so we can assist you with finding the optimal lid closing machine for your product and fill environment.